Six cylinder two wheel drive automatic 100,000 miles. Where is the fuel filter located on the above make/model vehicle? Read in another diagram on your site that : That I order to replace the gas filter, you must lower fuel tank from under the rear seat. Is that true? This gas filter is under the fuel tank? What a place to put this? The rear seat from be removed and then disconnect the Fuel pump module connector. You must lower the fuel tank, Omg! I do hope. My mechanic knows how to accomplish this. Will show him the diagrams you have sent me. And the others I found on site, plus the instructions of how to accomplish this. Anything else I should know before I he begins this job? I don't think he knows about the tank removal! This will be interesting. So you have the convertible? Yes, 2000 JXi convertible 2.5 ltr, 6 cyl car. Is the fuel filter under the tank or what? Please say it isn't! Just filled tank to brim, will not allow a lowering now. Just Put gas injector cleaner into it. Oh will these problemas ever go away? Another question, if the sensor for the radiator bad, will this cause the fan to be on a delay. Turning on after antifreeze has overheated? Or could it be an electrical problem with the fan? Better, what causes the fan to turn on AFTER rather than before the antifreeze heating up? Thanks for your quick response. Please be precise with answers, thanks. 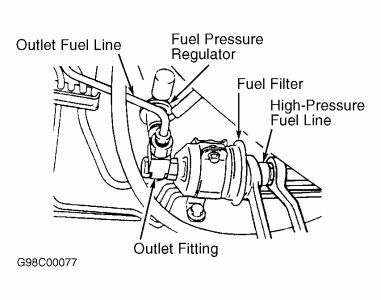 Your info is correct about the fuel filter you have to pop up the back seat and drop down the gas tank. Just like the info you found. As far as the radiator cooling fan goes yes the sensor can cause the fan to come on too early or too late. Without some trouble shooting cant say for sure whats going on with your fan. Where is the fuel filter located on 2002 Chrysler Sebring LXi Sedan? My dealer tells me it is part of the fuel pump assembly in the gas tank and is not available as a repair part. Dealer says have to purchase the complete pump/filter unit. Is this true? Yup. Other than diesel trucks, you'll never solve a running problem on a Chrysler product by replacing the fuel filter. As you drive it cuts back. When you step on the gas pedal it sputters then it goes faster. In tank with pump unfortunately. You could check flow by disconnecting line somewhere and turning on key. It should come out in a stream like water faucet on halfway. I disconnected the fuel line and turned the key half way. Their is not a steady flow like water coming out of the hose. What do I do next? Where can I find the fuel filter? 2.4L, the fuel filter is above the rear of gas tank. 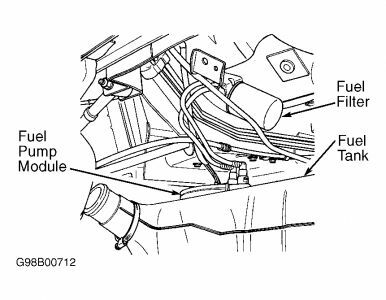 Fuel filter is located in the engine compartment, on the bulkhead, next to the brake booster.